Brand Entertainment Expo in Singapore. Various activities such as performance, signing event, and social contribution planned for honorary ambassadors. 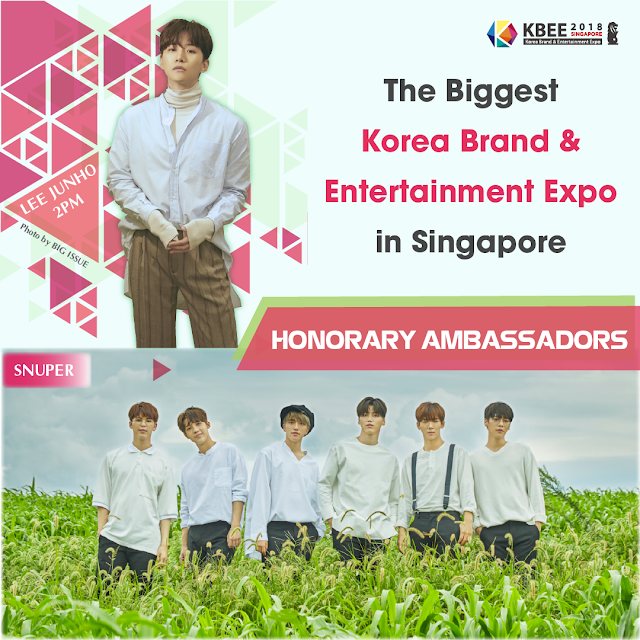 KBEE2018 is dedicated to contributing to the expansion of business and cultural exchanges between South Korea and Singapore. ‘Song Ji Hyo’, the honorary ambassador, is an actress, as well as a multi-entertainer as a model, TV show host, and entertainer. She is an influential Hallyu star with the maximum followers of 5.1 million for social media in the Greater China Region. Currently, she is actively performing in entertainment shows, movies, and soap opera including ‘Lovely Horribly’. Beauty variety TV show of her own name, ‘Song Ji Hyo’s Beauty View’, broadcasted in 9 Asian countries at the same time, not only succeeded domestically but also in Southeast Asia, which led her to be named as honorary ambassador this time. path for the last 10 years by performing in various fields as singer and actor in movies and TV shows. The number of followers to his personal social media account is close to 1.98 million. He is well- known and loved in Japan and Southeast Asia since 2013 through his solo album release and concert tours. He was also recognized as an actor of leading role by steadily performing in TV shows like SBS ‘Wok of Melo’, KBS ‘Manager Kim’, and movie ‘Twenty’. Recently, he has shown unchanging popularity by achieving rank 1 in Oricon chart in Japan with his 7th mini album, and sold-out of his solo tour in 5 cities in Japan. He will show the essence of K-Pop as solo singer in Singapore as honorary ambassador. ‘SNUPER’ is a K-Pop new idol group consisting of 6 members. They debuted in 2015, and they have been receiving the most attention as new Hallyu artists within the K-Pop music industry. They have been actively working in China, Japan, Vietnam, Singapore, Indonesia, India, Russia, UAE, as well as other countries. They were first well-known overseas through various achievements such as attaining the 2nd rank in Japan’s Oricon Daily Single Chart, reaching rank 1 in the Japanese Tower Record Album Selling, achieving total sales of over 100 thousand albums, winning the Golden Disk Award and performing on Vietnam’s top-ranked TV network channel, and holding independent fan signing events in Vietnam. They are continuously receiving attention as the next-generation K-Pop idol group and have not stopped their global race, as they won the 2017 Asia Artist Award’s New Wave Award and have performed in Singapore’s Hallyu Pop Fest 2018 this past September. 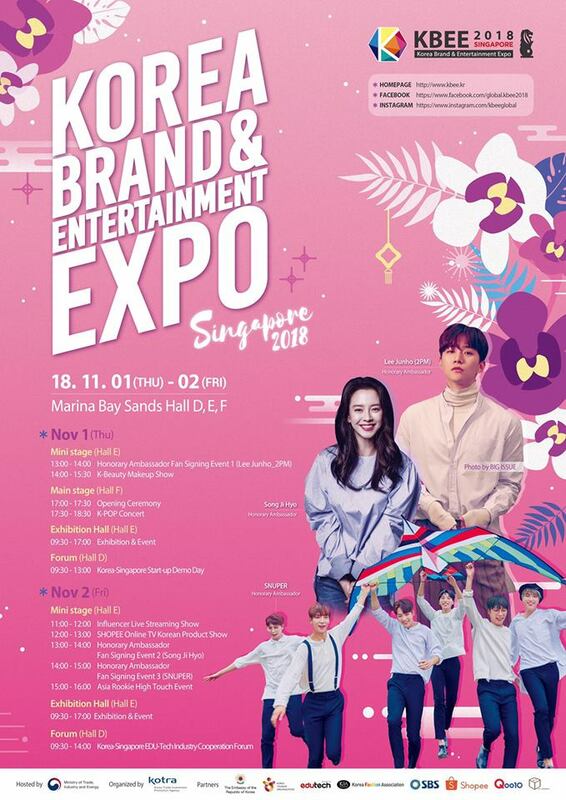 image of Korea Brand & Entertainment Expo and participating products through various events, such as fan signing event, press conference, and social contribution event (CSR)&, starting from opening greeting and K-Pop performance on November 1st. *‘Charity T-Shirt’ with signatures of the honorary ambassadors will be sold at the scene of the social contribution event: Korea Brand & Entertainment Expo, where honorary ambassadors and Korean business enterprises participate together, and all profit will be donated to Singapore welfare facilities. Participating business enterprises from Korea will also donate goods. Head over to KBEE Official Facebook Page for more details to meet your favorite artist during the event!